In an infographic showing just how much food residents of various countries eat each day, the U.S. trumps with 3,770 calories, followed by Austria with 3,760. With more than a third of Americans considered obese, it’s no surprise that the country has the highest calorie intake of any other in the world. 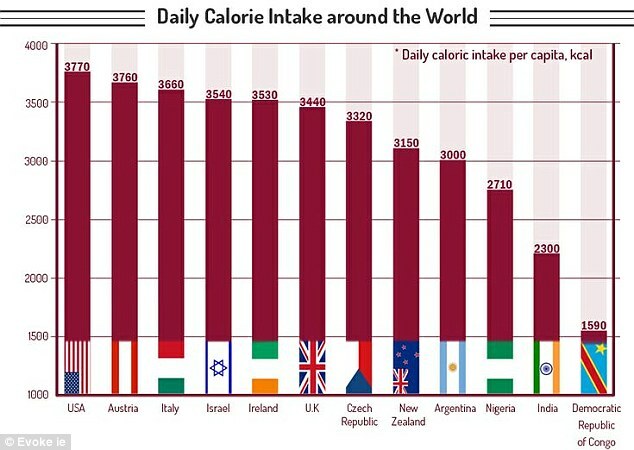 In a new infographic from health website Evoke.ie showing how much food residents of various countries eat per day, the U.S. trumps with 3,770 calories, followed closely by Austria with 3,760. The UK comes in sixth place, with people here consuming an average daily calorie intake of 3,440. The graph shows just how much the average American exceeds the recommended daily calorie intake. According to WebMD, women should consume about 2,000 calories per day while men should have no more than 2,400. Also in the top three countries is Italy, where local cuisine like pasta, pizza and bread no doubt contributes to the fact that residents here consume 3,660 a day. The infographic also shows just how much physical activity it takes to burn 200 calories, with some surprising results. Running up and down the stairs for just 2.5 minutes, for instance, will make you sweat enough to burn 200 calories. But it would take an hour of bowling to do the same. The same number of calories can be burned by playing a 40-minute game of badmintion, having a dance party for 37 minutes or doing jumping jacks for 2.5 minutes. But be wary of relying too heavily on machines at the gym to slim down. Shockingly, the infographic reveals that, on average, exercise machines overestimate calories burned by 19per cent. A much more reliable form of exercise is toting a baby around; the chart shows that this type of heavy lifting burns 250 an hour. At 2710 calories per day, Daily calorie intake comparison around the world, mailonline.co.uk, Margot Peppers, Nigerians are eating on the average more than the 2400 calories recommended for males, The U.S. trumps other countries as having the biggest eaters with almost 4000 calories per day!